Hard Disk Sentinel gives complete textual description, tips and displays/reports the most comprehensive information about the HDD inside the computer or in an external enclosure (USB / e-SATA). Many different alerts and report options are available to ensure maximum safety of your valuable data. Hard Disk Sentinel monitors hard disk status, including health, temperature and all S.M.A.R.T. (Self-Monitoring, Analysis and Reporting Technology, built in most hard disks today) values for each hard disks. Also it measures the hard disk transfer speed in real time which can be used as a benchmark or to detect possible hard disk failures, performance degradations. 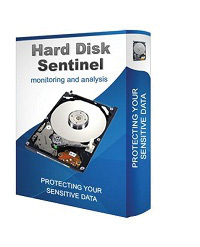 Hard Disk Sentinel can be effectively used to prevent serious damage or data loss because it has the most sensitive hard disk health rating system which is extremely sensitive to disk problems. This way even a small problem can’t be missed and a failure or data loss can be predicted. This gives opportunity to backup important and valuable data. The Professional version has scheduled and automatic (on-problem) backup options to prevent data loss caused by not only failure but by malware or accidental delete also. Just install, configure alerts and backup options and your system is now safe. You’ll be notified about the problems – but if everything is correct, Hard Disk Sentinel just sits on tray and displays current status. The data is protected even in 24 hours daily, 7 days a week. Instant S.M.A.R.T. analysing – Hard Disk Sentinel can communicate with IDE, Serial ATA and SCSI hard disks to detect their status and temperature. Disk status are displayed immediately as you launch the application, there is no need to analyse disks for a long period. It displays the current and maximum temperature for the hard disk. Information on demand – It can display current hard disk temperatures and health on the system tray, in a small status window and on the desktop itself. Average and maximum temperatures are logged for all hard disks and these informations are displayed in graphs for statistical purposes. Logging – Hard Disk Sentinel logs all degradations in all SMART parameters. For example, if a new uncorrectable sector is found on your hard disk, you will be notified. Alerts – Hard Disk Sentinel can make different kind of alerts upon different problems. It can execute various tasks (even external applications) in case of a problem. There is an option to send daily emails about current status. Hard Disk Performance – Logs how much data were read from or written to the hard disk. Displays current transfer rates for both reading and writing and estimates the maximum available (theoretical) transfer rate for a particular hard disk. Hard Disk Partitions – Displays partitions for each physical hard disks and type and usage informations about them so you cannot run out of space. Hard Disk Sentinel sends this information automatically in alert/status messages. Clock Synchronization – It offers option to synchronize the PC clock with an atomic clock via NTP (Network Time Protocol). Improvements – Hard Disk Sentinel is constantly improving. More features will be available soon. If you have any idea which can be useful, just let us know.